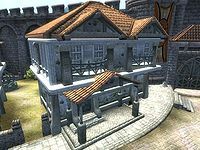 Newheim the Portly's House is a house situated within the Westgate district of Anvil. The house is situated beside Pinarus Inventius' House and adjacent from Jesan Sextius' House. 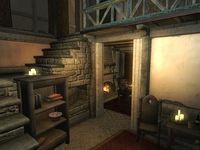 It is the sole residence of Anvil's harbormaster, Newheim the Portly, and consists of only one zone, Newheim the Portly's House. The front door opens to a cupboard on the left that holds an assortment of winery. A small seating area to the right holds several chairs as well as a small dining table that holds a bottle of mead as well as several apples within a bowl. Directly ahead is a staircase leading to the second floor and a shelf which stores a collection of books. Within a small alcove underneath the staircase is a locked chest that contains armor and weaponry. A dining area can be found within the room on the right and is spaciously lit up by the fireplace. Along the northwestern side of the room, a barrel contains clutter whereas a cupboard holds several items of food. Two pumpkins and a watermelon can also be found nearby. On a table along the southwestern wall, several bottles of cheap wine and mead are neatly arranged. A laid out dining table in the center of the room holds another bottle of mead, as well as some cheese, a corn cob, a potato, and also several apples, blackberries and radishes. A shelf nearby hold a majority of tableware, while a note and a watermelon can be found on the ground directly below. Several open-grain sacks as well as a barrel near the fireplace also contain more food. A second exit to the exterior of the house can be found along the southeast end of the room, as well as a pair of pigskin and thick cowhide shoes nearby. Heading up the stairs, Newheim's bedroom can be found directly at the top of the staircase. The room itself holds a double bed and a smaller fireplace lights up the room. A cupboard directly to the right of the fireplace contains common clothing, and a locked chest containing minor loot can be found directly above. A small seating area along the southwestern wall also holds a wedge of cheese and several more blackberries atop a small table. Another locked chest containing armor and weaponry can be found to the left of the bed itself. The key to the house is carried by Newheim. This page was last modified on 8 July 2018, at 11:50.